The complete source code for this article can be found in this gist. Django Admin is a powerful tool for managing data in your app. However, it was not designed with summary tables and charts in mind. Luckily, the developers of Django Admin made it easy for us to customize. There are a lot of tools, apps and packages out there that can produce very nice looking dashboards. I personally found that unless the product is an actual dashboard, most of the time all you need is a simple summary table and a few charts. Second, and just as important - no dependencies. If all you need is a little boost to your admin interface this approach is definitely worth considering. We are going to use a made up Sale model. 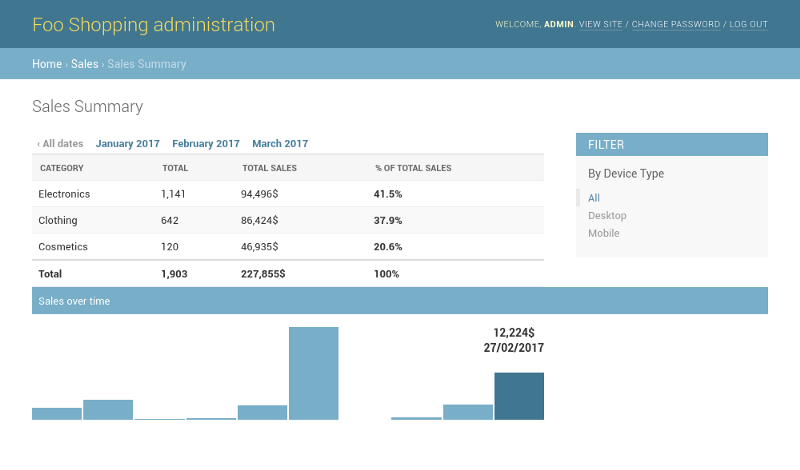 To harness the full power of Django Admin we are going to base our dashboard on a the built-in ModelAdmin. A proxy model extends the functionality of another model without creating an actual table in the database. Because we are using a standard ModelAdmin we can use its features. In this example I added a date_hierarchy to filter sales by creation date. We are going to use this later for the chart. The context sent to the template is populated by the ModelAdmin in a function called changelist_view. Call super to let Django do its thing (populate headers, breadcrumbs, queryset, filters and so on). Extract the queryset created for us from the context. At this point the query is filtered with any inline filters or date hierarchy selected by the user. If we can't fetch the queryset from the context it's most likely due to invalid query parameters. In cases like this Django will redirect so we don't interfere and return the response. Aggregate total sales by category and return a list (the "metrics" dict will become clear in the next section). The markup is important. To get the native Django look we need to render tables in the same way Django renders them. 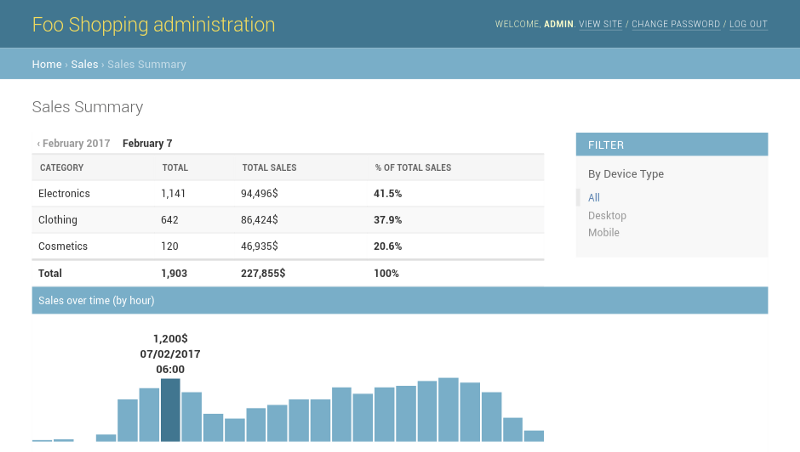 A dashboard is not complete without a chart so we are going to add a bar chart to show sales over time. To build our chart we are going to use plain HTML and some good ol' CSS with flexbox. The data for the chart is going to be a time series of percents to use as the bar height. For those of you not familiar with flexbox, that piece of CSS means "draw from the bottom up, pull to the left and adjust the width to fit". That's looking pretty good, but... Each bar in the chart represents a day. What will happen when we try to show data for a single day? Or several years? A chart like that is both unreadable and dangerous. Fetching so much data will flood the server and generate a huge HTML file. If the user filtered a single day each bar will be one hour (max 24 bars). If the user selected a month each bar will be one day (max 31 bars). If the user selected a year each bar will be one week (max 52 bars). More than that and each bar will be one month.